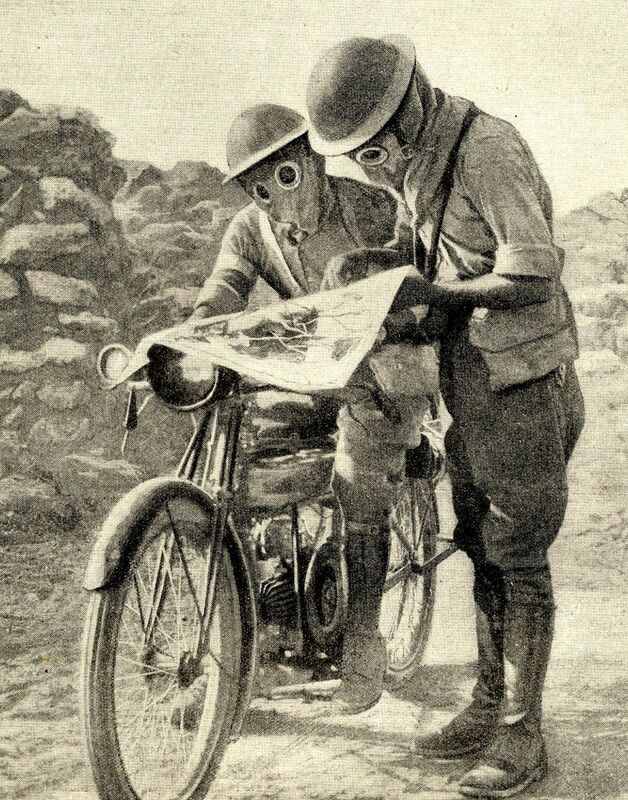 Royal Engineer Motorbike Despatch Riders Wearing Gas Mask at Salonika: Looking at a Map - full front page. In The Enemy Trenches After an Advance: German Red Cross Worker Carrying a Wounded Briton Pickaback. Small Map: Romania Showing Area of Mackensen's Operations in the Dobruja etc. The YMCA Trench Buffet: Men Just out of Action, Lined Up Before a YMCA Refreshment Post in the Trenches - full page (fp). British Motor Machine Guns Conveyed on Motor Bikes Leaving Camp. 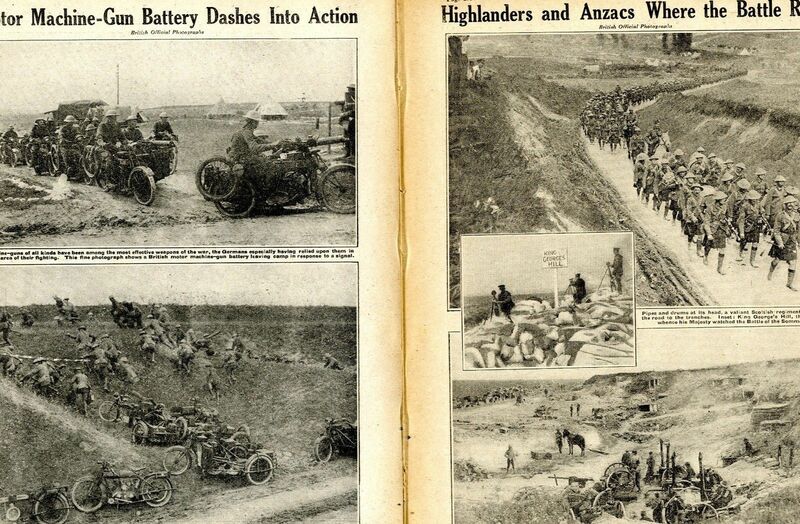 The Motor Bikes in the Cover of a Sunken Road While the Men Carry their Machine Guns up a Slope. Scottish Regiment with Pipes and Drums Lead Soldiers on a Road to the Trenches. King George's Hill, the Point Where George V Watched the Battle of the Somme - inset. Field Kitchen Within the Australian Lines. Birds Eye Views from a Hovering Kite Balloon on the Western Front - fp showing x3pics. Artillery Horses Up to Their Flanks in Mud Waiting to Move Forward. RFA Gunner Conveys Shells to His Battery on Mules miel - inset photo. 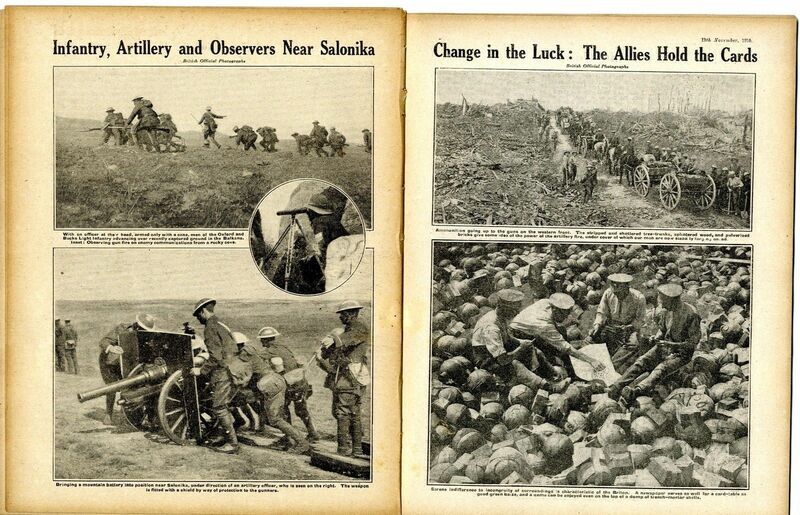 General View of Siege howitzers in Action; Men Haul Huge Shells to the Reserve. On The Yser: A Shell Bursting in a Village; A Sandbagged Embankment in the Foreground - fp. Private Thomas Alfred Jones of the Cheshire Regiment Who Went Out Against an Enemy Sniper and Single Handed Disarmed No Less Than a Hundred and Two of the Enemy - fp from a drawing showing the Germans surrendering to him at the Battle of Morval. Shelling Out in a Shell Hole on the Western Front - men being paid at Pay Parade on presentation of their pay books. Belgian Armoured Car on the Front. 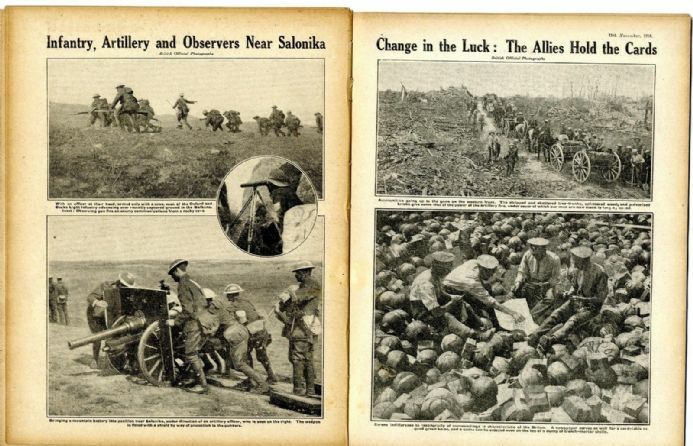 A Road Steam Roller in Difficulties on the Western Front with a Cheerful Scot at the Wheel. An Officer at Their Head only Armed with a Cane, Men of the Oxford and Bucks Light Infantry Advancing reive Over Captured Groun in the Balkans. An Officer Observing Gun Fire - inset photo. Near Salonika: Bringing a Mountain Battery nto position under direction of an Artillery Officer. Ammunition Going Up to the Guns on the Western Front AMongst Stripped and Shattered Tree Trunks, Splintered Wood and Shattered Bricks. Men Playing a Game of Cards on top of a Dump of Trench Mortar Shells - hp. German Trench Architecture: A Bedroom Found in a Captured German Dug Out. A Telephone Office Fitted up In Another Captured Dug Out. Some of the Men Who Stormed Thiepval: Smiling British Soldiers with German Helmets, Caps and Trophies - hp. German U-boat 53 with Her Captain and Crew in Newport Harbour USA After Delivering a Letter to the German Ambassador. German Crown Prince Wilhelm in Conversation with Officers and Men on the Western Front. A French Colonial Driver with His Convoy. Trap for the Impetuous Hun: Preparing a Ceval de Frise. Beginning of a Cheval de Frise to Consolodate Newly Captured Positions - barbed wire coiled round three stakes etc. British Soldiers Erecting Telephone Wire on Captured Ground. British Telephone Operator Repairing a Wire on the Somme Line of Advance. Telephone Post Improvised from a Tree. Statue of the Virgin at Montauban: Soldiers Dealing with An Unexploded German Shell at the Feet of the Statue. British Convoy Moving from One Battle Zone to Another Past a Cross in a Village. Lt. Col. John Vaughan Campbell VC - Coldstream Guards. Captain W. B. Allen VC - RAMC.Sleekburnc. 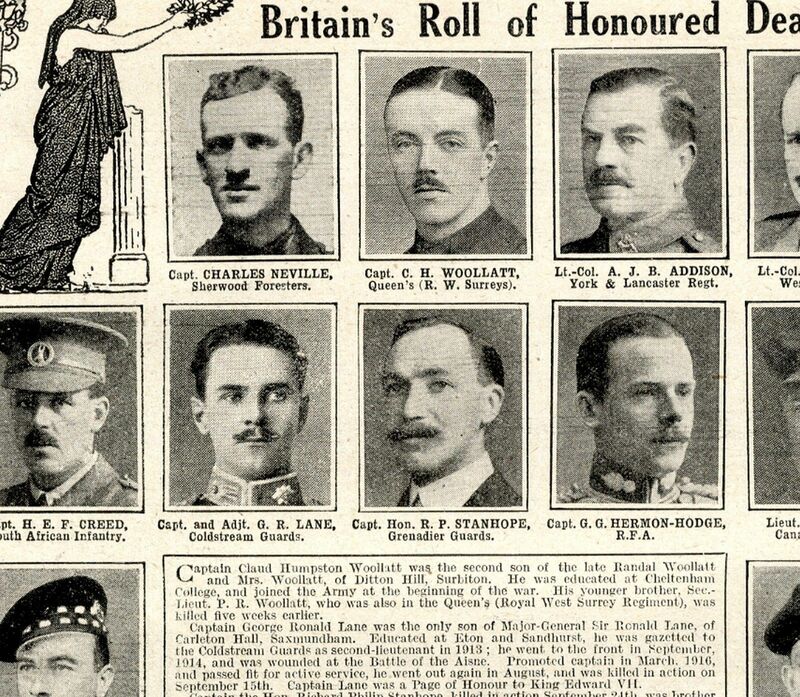 Lt. J. V. Holland VC - Leinster Regt. Sec Lt. G. G. Coury VC - South Lancs Regt. Sgt W. E. Boulter VC - Northants Regt. Sgt D. Jones VC - Liverpool Regt. Temp Capt. A. C. T. White VC - Yorkshire Regt. Capt N. G. Chavasse VC - RAMC. Private T. A. Jones VC - Cheshire Regt. Bt. Major W. La T. Congreve VC - Rifle Brigade. Lance SGt F. McNess VC - Scots Guards. Lieutenant B. G. D. Jones MC - Welsh Regt. Sec. Lt. N. Hurst MC - Royal Dublin Fus. Sgt G. Ward DCM - Royal Sussex Regt. Flight Com. T. H. England DSC - RNAS. Rev. A. S. Crawley MC - Army Chaplains Dept. Plus many caption articles to accompany the images. Please see main description link for content list (mobile users). An original used issue, not printed on the best of quality paper, but it more than makes up for this in terms of written content with many images. The four digit number in brackets in title is for my ref only. It measures 285mmx220mm (11.25 x 8.5") approx. Spine is loose with binding witness marks. There is age yellowing/toning and some marking. Some creases etc to corners and handling marks to edges. Images, photos sketches etc. vary in size. PLEASE NOTE: I cannot guarantee that the issue is complete 'as published' - but what I have described above IS present. The outer cover is missing; but as far as I can tell there are no other pages missing. If you're looking for something in particular in this issue PLEASE ASK. If you require information on size of articles (i.e. number of words), sizes of images, please ask before bidding or buying. This item will be packaged in a board backed envelope. The descriptive text in my listing, details the content in my words and not necessarily what is written on the original page."Info." in the description is my research, although relevant to the accompanying image or article, is not necessarily in the text. Antique and Vintage Prints, Maps & Ephemera - Newspapers, Magazines, Back Issues & Books.